Let us start this subject with an example. the oven freshness of that Pizza. Some service providers try to provide assurances by advertising "Oven fresh Pizza delivered to your doorstep inside 30 minutes or it is free". That statement demonstrates the service provider's skin in the game in providing us service. The service provider is willing to lose revenue and profits if a promise made is not met. Just like water which gravitates towards low lying land, consumers gravitate towards service providers who have a track record of making an attractive promise and consistently keeping that promise. A brand builds up. SLAs therefore are as important to service providers as they are to consumers. Consistent SLA performance helps establish a brand. What is attractive for different consumers could vary for the same service. For example, in the same aircraft that does long haul flights, someone who wants to arrive well rested and fresh at the destination will pay premium for a seat that can also become a bed at the flick of a switch (aka business class). 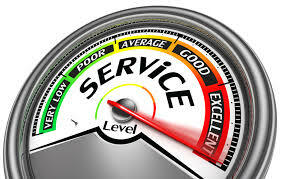 Therefore varying consumer needs and economic affordabilty drive service providers to create different tiers of service levels for the same service. Cloud computing SLA tiers are built around these attributes.